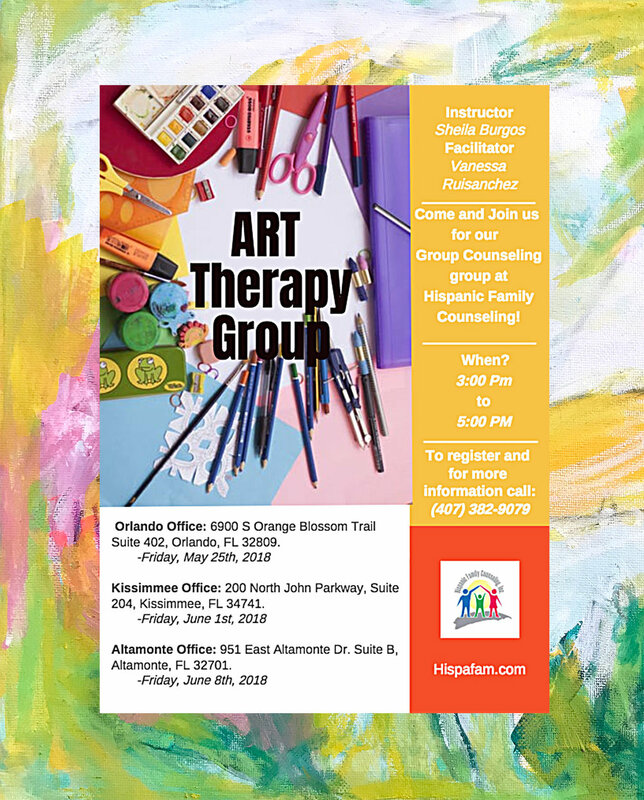 I will be offering new Expressive art Workshops with Hispanic Family Counseling. 3 workshops will be provided: Orlando - May 25, Kissimmee - June 1st and Altamonte - June 8th and I can't wait for you to attend. The process of intuitive painting and creating art is a beautiful playground in which to learn a ton of life’s lessons around healing, courage, imperfections, change, and so much more. Trust your voice while we begin to bring our paintings together by following (and trusting) our creative urges. Expressive arts bridge the gap between the conscious and the unconscious mind. It can bring light to areas of therapy that are blocked, inhibited, and stuck, as well as bringing greater focus to those areas of concern. The primary focus is on the process, which allows a person to discover new insight and meaning that might not be achieved with traditional talk therapy. Appropriate for all ages, it can enhance a person’s emotional, spiritual, cognitive, and physical well-being. While no previous experience expressive arts is required, several modalities available within expressive arts therapy magnify and deepen the process. • All are welcome. My workshops can be tailored to all ages and ability. dream big and set that amazing part of you free. • My workshops are a safe place where your art and creativity are sacred. I am not a therapist. I never analyze your artwork. The beauty of expressive arts is that you have the freedom to go as deep as you wish and share as much or as little as you are comfortable with. The artwork you create is for you and only you. • No pressure! It is about the process of art-making, rather than the results. Hope you can make it!!!! For more information Contact Hispanic Family Counseling at Tel (407) 382-9079.